Your Power Stroke, Duramax, or Cummins diesel engine provides you with several benefits over a more conventional gasoline powered car, truck or SUV. They now generally have higher miles per gallon as well as lower maintenance costs over all. These strengths were in fact disadvantages that hindered earlier diesel engines which gave way to the popularity of gasoline powered engines. That’s why, when it’s time to perform a maintenance or repair service on your diesel engine, consider Custom Auto Care where we will be more than happy to get your diesel back to where it needs to be, working for you. Diesel maintenance is important, if you are unsure of what is needed when it comes to your diesel engine, don’t hesitate to ask us! We can take a look at your diesel engine, depending on its overall condition, we can suggest a maintenance schedule that will help keep your engine operating at its peak level of performance. We work on all major diesel brands, including but not limited to, Duramax, Power Stroke, Cummins and up to 1 ton trucks. So if you think we can help you out when it comes to maintaining or repairing your diesel engine then we’ll take great care of your car, truck or SUV. 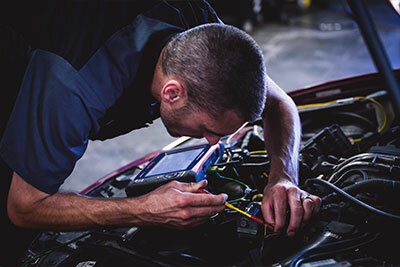 We have the latest in factory scan tools, factory hand tools and specialty tools that will allow us to provide your vehicle with the utmost care. We will never perform a service you don’t need, we will also confirm with you before performing a repair and save any broken parts for customer inspection. We understand that you know what is best for your diesel engine and that it is most likely your vehicle for work and play. You also probably only take it to a shop like ours when you absolutely have to, which means you can’t address the problem yourself. We understand, that’s why we want to give you every reason to trust us. Customer satisfaction is our top priority, so if you have any questions when it comes to your diesel engine, give us a call, drive on by our shop or feel free to conveniently schedule an appointment online for a time that works best for you!